It may be hard to believe, given what a Disney fan I am, but before today I had never seen THE LION KING. My oldest daughter was five when it was released, but looking at the release date, I know exactly why I wasn't among those who would have taken her to see it in a theater: I had just found out I was pregnant with our third child days before it was released, and I had, shall we say, challenging pregnancies. I was doubtless home with our then two-year-old. Over the years I've seen enough bits and pieces that they probably add up to the entire movie, but I'd never actually sat down and watched it straight through from beginning to end. Frankly, I think I've also avoided our DVD because of my reluctance to deal with what might be called the "Bambi's Mother" aspects of the story. Although I'm not a huge fan of animated films being rereleased in 3D, I decided to take advantage of the current 3D reissue and see THE LION KING for the first time on a big screen. I'm thrilled to say that I really loved the entire experience, particularly being immersed in the superb Elton John-Tim Rice songs -- certainly one of the finest of Disney's long line of great scores for their animated musicals. The storyline, as most everyone must know, is about Simba (Jonathan Taylor Thomas), a cub whose father Mufasa (James Earl Jones) is King. Mufasa's jealous brother Scar (Jeremy Irons) kills Mufasa, and an erroneously guilt-stricken Simba flees. Eventually, of course, the adult Simba (Matthew Broderick) returns to take his rightful place as King and drive the evil Scar away. 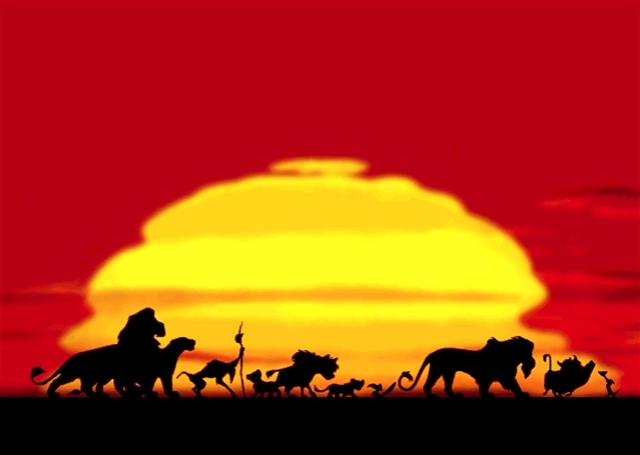 The film is basically structured as a collection of set pieces, including several musical numbers, beginning with the stirring "Circle of Life" before the opening title card. That sequence alone is worth seeing the film. The child Simba sings "I Just Can't Wait to Be King." Simba grows up -- and learns to live with his guilt -- during "Hakuna Matata." His reunion with childhood playmate Nala (Niketa Calame, later Moira Kelly) is portrayed in "Can You Feel the Love Tonight?" Of course, these are all now classic standards in the Disney canon. My favorite character was the wise man, Rafiki (Robert Guillaume), and I think my favorite moment was when Rafiki found Simba and guided him to hear Mufasa's voice once more. The shooting stars as Simba returned home were beautiful. I also loved the very moving "Circle of Life" conclusion. The film is undoubtedly influenced by BAMBI, and I also saw touches of SUPERMAN (1978) -- when Simba hears his father's voice, I couldn't help thinking of Clark Kent hearing from Jor-El at the Fortress of Solitude. The voices are all excellent, with Jeremy Irons particularly memorable as the slimy, scary Scar; Irons even sings, quite effectively, in "Be Prepared." Additional voice actors in the film include Nathan Lane, Ernie Sabella, Rowan Atkinson, Whoopi Goldberg, Cheech Marin, Jim Cummings, and Madge Sinclair. 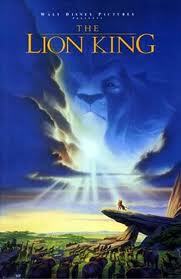 THE LION KING was directed by Roger Allers and Rob Minkoff. It runs 89 minutes. 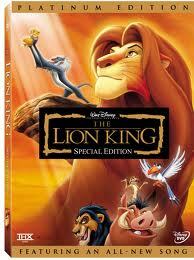 There were two direct-to-video sequels, THE LION KING II: SIMBA'S PRIDE (1998) and THE LION KING 1-1/2 (2004). THE LION KING was a powerful viewing experience, filled with moments of great visual and musical beauty. If there's anyone else out there who hasn't yet caught this film, I highly recommend going to see it before its current theatrical run comes to an end. Related post (October 18, 2015): Tonight's Theater: The Lion King. The Lion King is also the story of Hamlet! But lol, it is so shocking that you'd never seen this film before! When it was finally released on home video, it was a staple not only in my household, but in school (I remember briefly vacillating between my hatred of this and Jumanji after my classmates requested them over and over for Friday movie period). We've owned this movie for many years, but I think one reason among many I never sat down and properly watched it from start to finish is I got tired of the bits and pieces I would hear over and over again when my children watched it when they were young and I was otherwise occupied. (Grin) It's been a while since it was in regular play at our house, so I have had a nice break from "hearing" it and could approach it from a fresh perspective.